1. In frypan over medium heat, cook bacon. Set aside on paper towel, leaving the bacon grease in the pan. 2. Cook onion in bacon grease until translucent, a few minutes. 3. 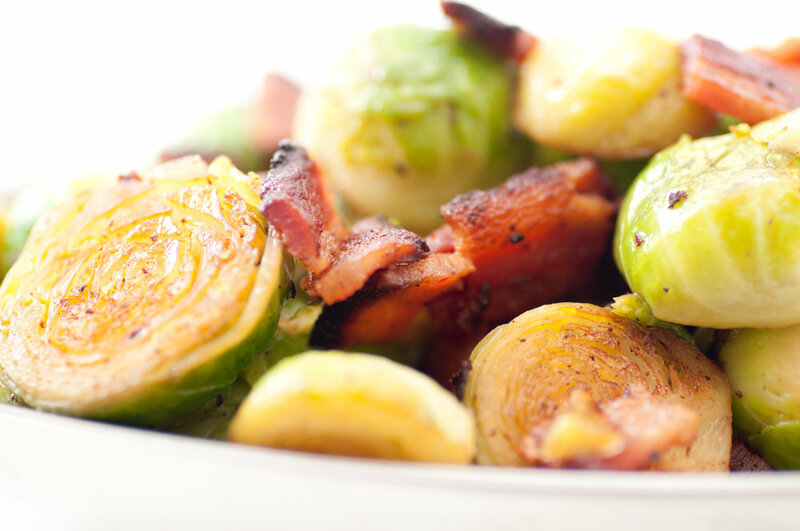 Add halved Brussels sprouts and chopped bacon. 5. Season with salt and pepper. Serve warm. Just in time for the holidays. No gluten, grains, or dairy! In a large bowl, mix together melted and cooled coconut oil, coconut sugar, molasses, egg and vanilla extract (make sure your coconut oil is cool). Next add in almond flour, coconut flour, baking soda, spices and salt; mix well to combine and form a dough. Let the dough rest for just a few minutes. Use a cookie scoop to scoop dough, then use your hands to roll dough into a ball. Roll dough in organic cane sugar then place on an ungreased baking sheet. Gently flatten the dough with your hand or the back of a glass. Bake for 8-11 minutes. Allow to cool on cookie sheet for 10 minutes before transferring to a wire rack to finishing cooling. Savour the flavours of fall with our cozy recipes with a spin. We even have a dessert recipe to help satisfy your sweet tooth. These tasty and satisfying fall recipes feature in-season ingredients you can find at your farmers’ market, and they're perfect for perking up chilly nights. Keep checking back for more! 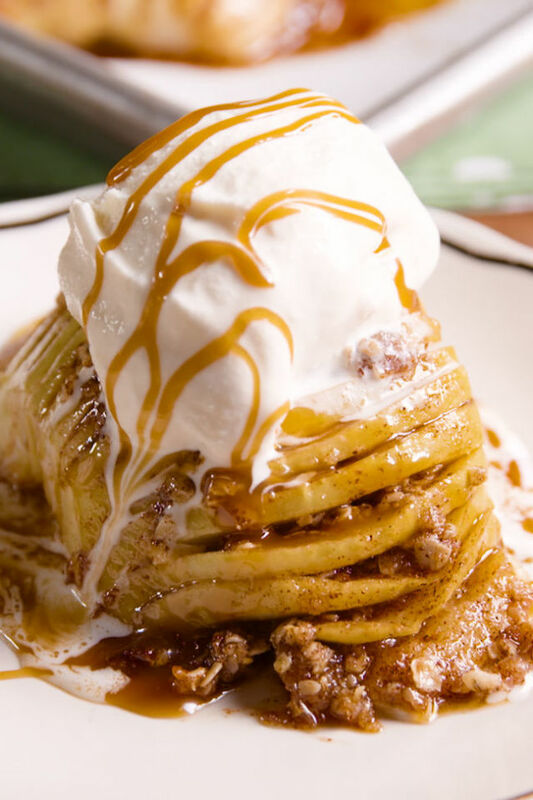 Sinfully sweet and timely with fall apple picking in full swing. Preheat oven to 350 degrees F and line a baking sheet with parchment paper. Place each apple half flat side down and use a paring knife to create thin slices all the way across, making sure to stop slicing right before the bottom of the apple (so it stays together as one piece). Transfer ap ple halves to prepared baking sheet. Lightly brush apple tops with melted butter and sprinkle with sugar. Bake until apples are soft and caramelized, 23 to 25 minutes. Remove from oven. In a small bowl, combine remaining melted butter, sugar, cinnamon and oats. Once cool enough to handle, spoon mixture inside apple slits. Return to oven and bake 10 minutes more. Top each with a scoop of ice cream, then drizzle with caramel and serve. Not only is it meatless, it’s also vegan. Winning. Heat a large skillet on medium heat and add 1 tablespoon of olive oil. When the oil is hot, add the mushrooms and a pinch of salt, sauté for 10 minutes or until browned. Remove from the skillet and set aside. Add one tablespoon of olive oil to the skillet and add the carrots. Sauté until they begin to brown, then add the onions. Cook the onions until they become translucent, then add the shallots. Cook until they are browned and caramelized. Add the garlic and cook for 1 minute. Add the vegetable broth and red wine to deglaze the pan. Stir and loosen the pieces of onion and shallot that may have stuck to the pan. Add the tomato paste and stir until it liquefies. Add the salt, thyme, Italian seasoning and pepper, stir to combine and reduce the heat to a low simmer. Cover and cook for 20 minutes. Mix the flour (or corn starch if you want to make it gluten-free) and water together until the flour breaks down and the mixture resembles a thick milky substance. There shouldn’t be any dry flour in the mixture. Add it to the wine sauce and stir well to combine. Add the mushrooms and stir to incorporate within the sauce. Cover and simmer on the lowest temperature for 20 minutes. The sauce will thicken into a stew. Be sure to lift the lid and check to make sure it’s not sticking to the pan or evaporating. That shouldn’t happen if the temperature is low enough, but if it does add a small amount of broth or water and stir. Easy to make, and deliciously sweet and savoury. Preheat the oven to 400 degrees F. Meanwhile, cut the tops off of 6 mini pumpkins and remove the seeds. The seeds can be discarded, but they can also be reserved for roasting, much like larger pumpkin seeds. Lightly brush olive oil over the inside and outside of the pumpkin bottoms and tops and season with salt and pepper to taste. Bake for 25 to 30 minutes with the tops on the pumpkins. The pumpkins are done when the inner flesh is tender. After placing the pumpkins in the oven, make the quinoa. First rinse the quinoa well and then combine 1 cup of quinoa in a saucepan with 2 cups of vegetable broth. Bring to a boil, then reduce to a simmer and cook covered until all of the liquid is absorbed. This will take 15 to 20 minutes. Meanwhile, sauté the mushrooms and leeks in 2 teaspoons of olive oil for about 5 minutes, or until tender. Add the garlic, rosemary, and thyme to the skillet and cook 1 more minute. Next, add the white wine and cook until the wine is mostly evaporated. Season with the salt and pepper. By now the quinoa should be done cooking. Measure 2 cups of cooked quinoa into the skillet with the mushrooms and leeks. Stir to evenly combine. Remove the cooked pumpkins from the oven and spoon the quinoa pilaf evenly into each pumpkin. Consider garnishing with a little parsley for added colour. Serve immediately. Lavender has long been touted as an excellent sleep aid. I just read this study about lavender essential oils. Psychologists at Wesleyan University asked 31 men and women to sniff lavender essential oil one night and then distilled water the next for four 2-minute periods just before bedtime. The researchers monitored their sleep cycles with brain scans. On the night they whiffed the herb, subjects slept more soundly; they also felt more energetic the next morning. So, make some tea and by all means splash some lavender on your pillow before bed. You will thank me in the morning. In a loose-leaf tea strainer, teaball, or empty teabag place the lavender and chamomile buds. Put the straining device in your cup and pour the boiling water over it. We suggest letting the tea steep for 10-15 minutes-to fully develop the flavor. If you don’t have a tea-ball you can pour the water directly on the buds, and after steeping you can strain with a mesh strainer. If you wanted to create the perfect smoothie with anti-cancerous properties, potent anti-inflammatories, as well as antiviral, antibacterial and antifungal constituents, look no further than adding turmeric. This is also the perfect post - workout shake to aid healing and muscle growth with the high-GI fruit combined with whey protein! In a blender mix all the ingredients and blend fully. For added protein add your favourite protein powder once all ingredients are blended. Don’t over blend the protein powder! I made this on the weekend and loved its creamy and delicious flavour. Salad season is definitely not over. Heat a large skillet over medium heat and add coconut oil. Sprinkle the squash slices with salt and pepper, then add them to the skillet and cook until golden. If desired, you can add the brown sugar to help the squash caramelize. Heat a small saucepan over low heat and add the pecans. Toast until they are slightly golden and fragrant, stirring and shaking the pan as they toast, for about 5 minutes. Toss them with the pumpkin pie spice. Add the arugula to a large bowl with a pinch of salt and pepper. 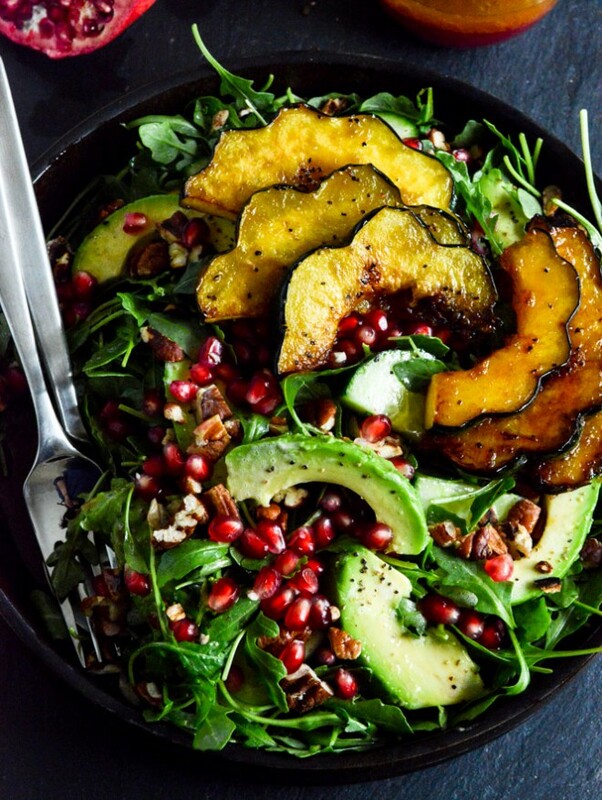 Add in the avocado, pomegranate arils, cucumber, pecans and squash pieces. Drizzle with the pomegranate dressing be low. Combine pomegranate juice, apple cider vinegar, ginger, garlic, salt and pepper in a large bowl and whisk together. Stream in the olive oil while constantly whisking until the dressing comes together. Plate the salad and layer on the remaining ingredients and enjoy! If you want to go full veg with this hearty chowder, skip the bacon and replace with 2 tablespoons of olive oil. This fall soup will be a family favourite. In a large pot over medium heat, cook bacon until crispy. Transfer bacon to paper towels and drain all but 2 tablespoons of fat. To pot, add onion, carrots, and celery. Season with salt and pepper. Cook until slightly softened, about 5 minutes. Add garlic and cook until fragrant, 1 minute. Sprinkle in flour and cook 2 minutes. Add thyme and cauliflower. Pour in broth and milk and bring to a boil. Immediately reduce to a simmer until cauliflower is fork tender, about 15 minutes. This low-carb alternative might just be better than the real thing. Prepping for next week’s meals? The ingredients of this meal make it a cinch. Cut squash in half lengthwise. Rub all over with olive oil and season with salt and pepper. Place flesh side-down on baking sheet. Bake for 40 to 45 minutes, until the spaghetti squash is tender. Let cool until cool enough to handle, then use two forks to pull apart spaghetti squash flesh into fine noodle-like strings. Meanwhile, cook bacon in a medium skillet until crispy. Transfer to a paper towel-lined plate to drain. Pour off half the bacon fat and add garlic, tomatoes and spinach to the skillet. Season with salt and pepper. Add heavy cream and Parmesan cheese and let simmer until slightly thickened. Add spaghetti squash and toss until fully coated. Crumble bacon over the squash and stir to combine. Garnish with basil. Cauliflower takes the place of bread in the low-carb stuffing of your dreams. Perfect for stuffing chicken, turkey, pork or peppers. Add cauliflower and mushrooms and season with salt and pepper. Cook until tender, about 8 to 10 minutes. Add parsley, rosemary and sage and stir until combined, then add vegetable broth and cover with a lid. Cook until totally tender and liquid is absorbed, about 15 minutes. In a large saucepan, cover the eggs with water and bring water to a boil. When the eggs are cool, peel them and slice them in half lengthwise and transfer to a serving plate. Eggs are a very good source of inexpensive, high quality protein. More than half the protein of an egg is found in the egg white along with vitamin B2 and lower amounts of fat and cholesterol than the yolk. The whites are rich sources of selenium, vitamin D, B6, B12 and minerals such as zinc, iron and copper. Egg yolks contain more calories and fat. They are the source of cholesterol, fat soluble vitamins A, D, E and K and lecithin. Avocados have a unique nutrition profile. They contain lots of fiber and are rich in vitamins and minerals, such as B-vitamins, vitamin K, potassium, copper, vitamin E and vitamin C.
Simple to make...creamy in texture! Plus, the pastel green is perfect for spring!